Department of Normal Physiology, N. I. Pirogov Second Moscow Medical Institute. Institute of General Resuscitation, Academy of Medical Sciences of the USSR, Moscow. 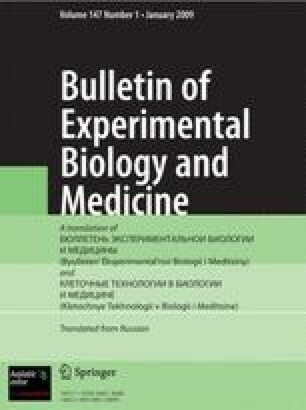 (Presented by Academician of the Academy of Medical Sciences of the USSR V. A. Negovskii.) Translated from Byulleten' Éksperimental'noi Biologii i Meditsiny, Vol. 112, No. 10, pp. 339–340, October, 1991.